Just a few days ago I finished this sweet little dogbook called Girl by Gerald Green. 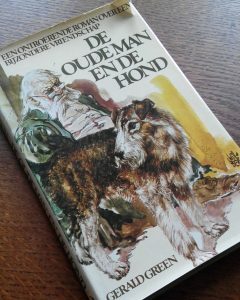 I do have this book in my own language where it is titles "De oude man en de hond". This book was standing in my bookcase for a very long time, but because of study I didn't have the time to read a ordinary book. So now I have all the time to read and this was one of the first ones I choose from my huge collection. The story is pretty simple, an old man called Riddle has his dog Girl and he claimes that she knows more then 4000 words, he goes around with his dogs on carnivals and he gets noticed to be in a tv program. I won't spoil the story you must read it for yourselve. It still in available online and it is not an expensive book.